The river of life flows on. Few stop to stare; even fewer to think about it. Until! You come to Narmada. The Narmada or Nerbudda forms the traditional boundary between North and South India. 1,289 km long, it is one of only three major rivers in India that run from east to west, along with the Tapti and the Mahi river and the only river that flows in a rift valley. The Narmada rises in the Amarkantak Hill, Madhya Pradesh, and for the first 320 kms winds among the Mandla Hills, at the head of the Satpura Range. 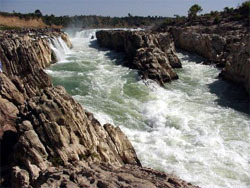 In Jabalpur, it polishes all the marble rocks on its course, and enters the Narmada Valley From there it pursues a direct westerly course to the Gulf of Cambay, passing through Madhya Pradesh, Maharashtra, and Gujarat, and emptying itself into the Arabian Sea in the Bharuch District of Gujarat. During this course it passes by the old British town called Hoshangabad just an hour away from Bhopal. And there it is worshiped like a Goddess. I am fortunate to belong by partnership to a family who believes that they were originally from Hoshangabad and then went to South India as Brahmin priest at the temples. And like the great ancient river, the family whirled and winded its path back to where it belonged, beside the Narmada. They built a house by the river for their sadhana. Thus, I go there, once in a while, when Delhi drives me nuts and my relationship stands on the rocks! Then, we both go and take a dip in the Narmada. It rejuvenates our hearts again, over and over again. Hoshagabad was called Narmadapur after the river. The city is famous for the beautiful Sethani ghat along the banks of river. Hindu saints hold regular religious discourses on Ramcharitmanas and Gita at the ghat. Also The Security Paper Mill on the outskirts of the town, which prints the Indian currency notes, has helped Hoshangabad from going industrial. For a radius of 5 kms around the town, no industry is allowed. Hence, Hoshangabad, maintains the rustic beauty of a small town untouched by the monstrosity of a city life. Hardly 2 kms away is Adamgarh, known for its old age rock painting on the stone caves. The soft spoken MP-ites at Hoshangabad, work in various capacities in education centres, govt offices or just run their small businesses. It is a quiet town and you can go for your morning walk and view the British bungalows and the old trees. For generations birds have been homing in the nests they build on these trees. So hush! Don't carry your mobile phones on your walks. If your cell rings, the birds might think you are a cuckoo! And start chirping around as if you are their comrade. Poor things! They cannot distinguish the real bird-brained creatures. Subbu and Rashmi are my dear brother and sister who along with a number of brilliant people from JNU, New Delhi and IIT-ians from across the country, Eklavya Institute. They are part of curriculum planning and textbook development for children who go to State- run schools. The program is a huge success in many states of India. But my love for the couple is not so much for their brains ' that goes without saying ' but for their absolute open house and hospitality. Along with my partner's parents they are the only TamBram family living in Hosangabad'.Quite a sight that! They seem to run an unofficial Homestay, which is free for all. Everytime I am there, there are many new faces to look at so much so that their little daughter, Sarada is hard to find, until she peeps out from in between the people.
' Chalo! Let us go to the other end of the river by boat. Chalo na'.' She squeals. I can never resist her small hands in mine, her flighty steps and her absolute enthusiasm, as she leads me down to the river and I board the boat, which ferries me to the other side of the river. It has rained. So, the water is muddy ' brown, earthy and voluptuous. I sit in the boat and touch her waters as she gushes through my fingers - Narmada, moving, forever moving but still, so still and so profound. I wonder at life'.a river of energy ferrying me around, so silently beautiful, so childlike, like the young face of Sarada smiling'ever a beam of light and hope'.she came as a gift to the family from an orphanage at Indore, bringing life and love and eternal joy.